The U.S. Air Force is getting bases ready for its new B-21 Raider stealth bomber. But it’s still unclear how many B-21s the flying branch might buy. The Air Force selected Tinker Air Force Base in Oklahoma as the main maintenance facility for the new bomber, the service announced on Nov. 16, 2018. Robins Air Force Base in Georgia and Utah’s Hill Air Force Base will support the stealth bomber work at Tinker, the Air Force stated. Edwards Air Force Base in California will host the B-21 test force, the Air Force revealed in the same announcement. None of the choices is surprising. Tinker already hosts a major Air Logistics Complex, whose nearly 10,000 civilian and military employees do deep maintenance on older B-1B and B-52 bombers as well as KC-135 tankers and E-3 and E-6 command planes. Edwards already hosts test forces for nearly all of the Air Force’s warplane types. 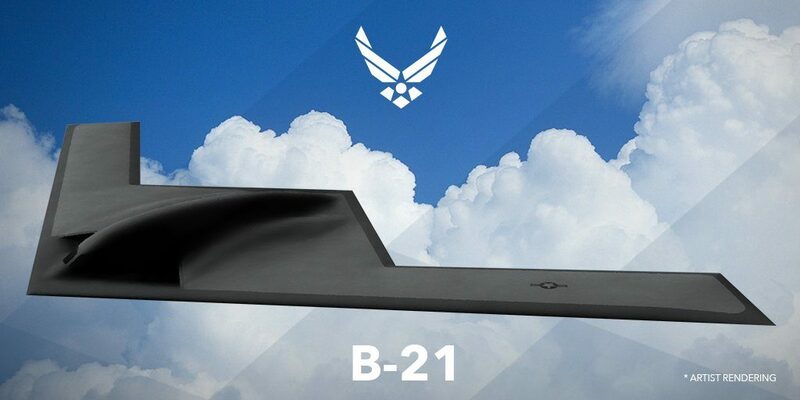 “The decision to use these bases marks the next milestone in the development and eventual deployment of the B-21, a long-range and highly-survivable aircraft capable of penetrating air defenses and conducting a range of critical missions,” the Air Force stated, adding that the first Raiders should reach the force in the mid-2020s. But it’s an open question how many B-21s the Air Force will get. At the time the Pentagon tapped Northrop Grumman to build the Raider, back in October 2015, officials said they expected the Air Force to acquire between 80 and 100 B-21s for an overall cost of around $20 billion. The plan at the time was for the B-21 to replace existing B-2 and B-1B bombers at their bases in Texas, South Dakota and Missouri. “Using the current bomber bases will minimize operational impact, reduce overhead, maximize re-use of facilities and minimize cost,” Air Force officials said. In 2018 the Air Force possessed 20 1990s-vintage Northrop Grumman B-2s and 63 B-1Bs that Rockwell built in the 1980s. The service expects, starting in the late 2030s, to operate at least 100 B-21s alongside upgraded, 1960s-vintage Boeing B-52H bombers, 76 of which were in service as of late 2018. But the number of bomber squadrons could grow. In 2018 the Air Force maintained nine front-line bomber squadrons. In September 2018 the flying branch announced a plan to add five bomber squadrons as part of a wide expansion of its force structure. “Although the goal was not accompanied by specific procurement plans, observers note that would likely necessitate 75 additional bombers, with only the B-21 then in production,” the Congressional Research Service noted in an October 2018 report. If the Air Force indeed adds five bomber squadrons and retires the B-52H along with the other older bombers, it could need more than 200 B-21s, significantly adding to the program’s cost.